The foundation of trusted Internet communications are Secure Socket Link (SSL) certificates, an encryption technology installed on Web servers that permits transmission of sensitive data through an encrypted connection. Using a public-key infrastructure (PKI), SSL certificates authenticate the end-use Website and the endpoint server, making it difficult for those sites to be imitated or forged. The acquisition of SSL certificates should always be a relatively easy experience; however, the purchasing decision should never be regarded lightly. When businesses consider SSL certificates; there six Golden Rules a purchaser should keep in mind. 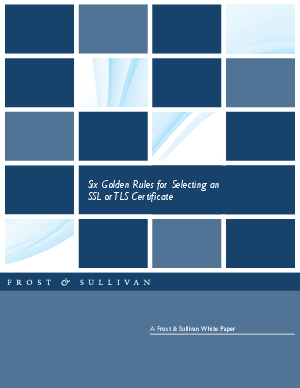 This whitepaper provides an overview of the SSL certificated market, the six golden rules of purchasing SSL certificates and how Symantec addresses each of the golden rules. At the end of the day, people want to make sure their Web sites are secured with as little friction as possible—Symantec gives businesses every opportunity to achieve that goal.